Cocopeat is an organic material and its production is part of the many uses of the coco nut. When using Cocopeat for hydroponic growing the environment is not harmed. Cocopeat is an excellent substrate for root development and therefore transplanting can be made directly into the Cocopeat with no need for any further treatment or agent. 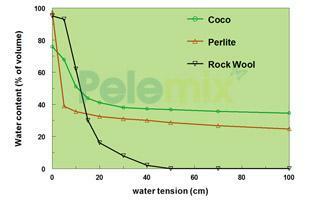 Unlike other soilless cultures, Coco holds high air capacity even when completely saturated. The drying duration of Cocopeat is slower than many hydroponics mediums (not including Crush coir- cocopeat material), even though Cocopeat holds more air when completely saturated. With time the Cocopeat develops a high buffer capacity that will enable the plants to overcome a short time deficiency of fertilizers and water. The ability to choose a different fraction or mix of Pelemix Cocopeat enables the grower to choose the most suitable growing media that will give the best results in a given climate. Planting Directly into Coco Directly into Coco Directly into Substrate Depends on the use of planting cubes, variety hard without it. Disease The plastic bag limits free movement of pathogens. Reduces humidity. Free movement of pathogens. No control on humidity levels. The effect depends on bag material and quality. The plastic bag limits free movement of pathogens. Reduces humidity. Buffer Capacity Will provide adequate water and nutrient supply even after 2 days without irrigation Will provide adequate water and nutrient supply even after 2 days without irrigation Very sensitive to any problem in fertigation system. Wil provide low water. No buffer capacity. Degradation during crop period Slow degradation during crop period Loss of material depends on the through size and the management of the plot. Mechanic degradation during crop period. Slow degradation during crop period.